For those of us who love Space, the final frontier, what could be better than a starship on the roof? The inspiration for this Spaceship Weathervane came from a mother and her two sons who commissioned this copper sculpture piece in celebration of her husband’s 40th birthday. He had just finished building a wooden gazebo in their backyard and was very proud, but commented that it really needed something on top to finish it off. 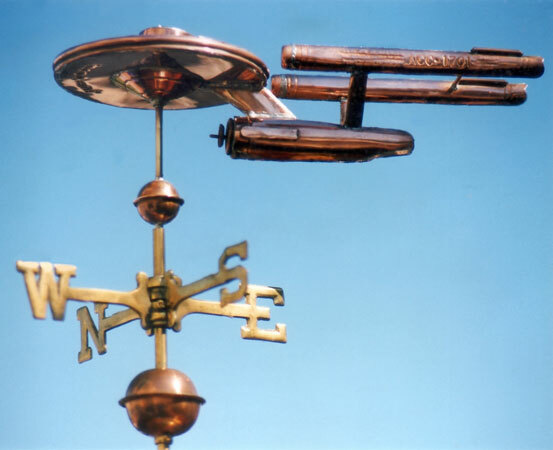 As he happened to be an ardent sci-fi fan they thought this Starship Weather Vane would make a perfect birthday gift and topper for the new gazebo. There is an authenticating tradition that just before you solder shut the final seam on a weathervane, you slip in a copper penny from the year the weathervane was crafted. This began in the Victorian Age and is one that we have continued here at West Coast Weather Vanes. Because this was a special birthday present, in addition to the penny from the year in which it was made, we included ‘Lucky Pennies’ from the year the dad was born, as well as pennies from the year each family member was born. We affixed the pennies from the year the dad was born and the year he was celebrating his 40th birthday to the back of the thrusters so he could see them when he opened the gift. We received a letter from his wife saying how much he loved his weather vane and how he boldly went where no one had gone before. He was our first customer to install several solar lights on the roof of the gazebo and pointed them at his spaceship. Now, at night, they look out their windows and see their own personal Starship hovering in their backyard!